* Certain 512MB DIMM modules are supported. 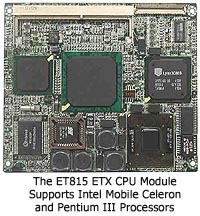 The ET815 is a CPU module based on the Intel 815E chipset. Measuring 100mm x 114mm, the module supports standard interfaces including USB, VGA, audio, Ethernet, IDE, serial ports, IrDA and parallel port. With its flexible plug on and compact Features:, ET815 can be implemented to support form factors including ATX, 5.25" Disk Size, and PICMG CPU Cards.